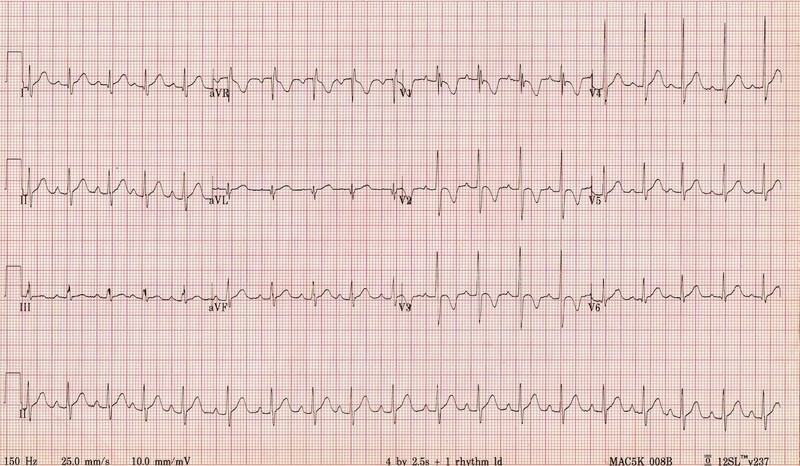 Why do we do ECGs in the emergency department? With the first few breaths, there is a fall in intrathoracic pressure in the neonate and a subsequent decrease in pulmonary vascular resistance and increase in systemic vascular resistance that within the first month of life results in a larger and thicker LV compared to RV. Normally sometime during the first week of life the upright T waves in V1-V3 on a neonatal ECG will become inverted, resulting in the typical “Juvenile T wave inversion pattern” that may persist variably into adolescence. As a child ages the T waves will become upright first in V3 and then V2. Many adults will demonstrate ongoing T wave inversion in V1. Resting heart rates and conduction intervals differ in children and vary with age. Those such as PR and QTc tend to be shorter compared with adults. Population studies to create a normal range of values include a study of 1912 Dutch children by Rijnbeek et al. These studies comprise tables presenting age-specific limits of various ECG parameters. Adolescents in particular may have elevated J points demonstrating early repolarisation and it may be challenging to differentiate this from ST segment elevation. When evaluating the paediatric ECG, it is important to follow the same systematic approach taken when evaluating adult ECGs so as to not miss any abnormality. However, set out below are examples of diagnosis patterns to consider when evaluating paediatric ECGs. It shows P waves that are taller than 2.5mm in lead II. This may suggest right atrial enlargement. Right atrial enlargement in isolation is non specific but may raise suspicion of congenital heart disease, particularly atrial septal defect, but also including tricuspid atresia, pulmonary stenosis and Ebstein’s anomaly. However anxious children may breath-hold, causing pooling of blood in the right atrium. Getting the child to relax and then repeating the ECG may get rid of the abnormality . ECG shows LV hypertrophy and this child has hypertrophic cardiomyopathy. QRS complexes are dominant particularly in the lateral leads I, V5, V6, aVL. ECGs in children are poorly sensitive for LV hypertrophy. 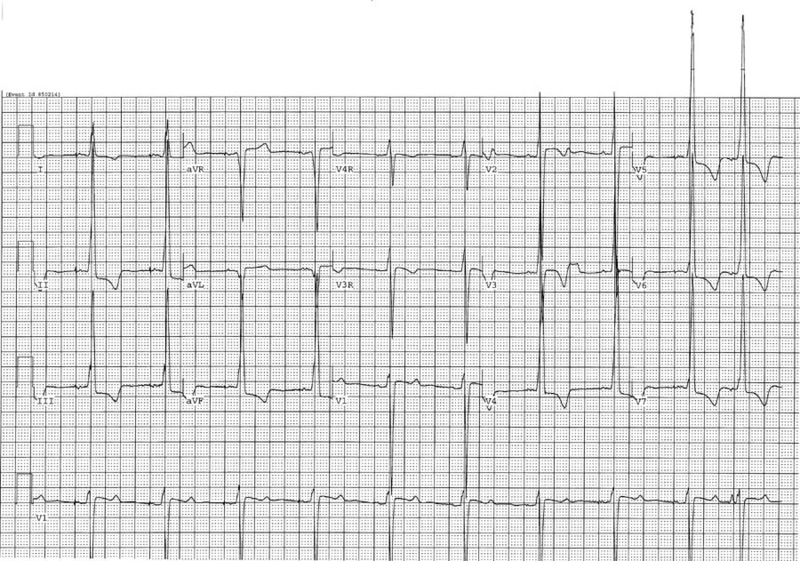 What abnormality would you expect to see on the ECG of the following patient? A three year old irritable boy with a week history of high fever is brought to the Emergency department by his mother. Mum is concerned about his red eyes and lips and she has noticed his fingers and feet appear swollen. There is no history of foreign travel. Paediatric ECG’s interpretation requires a different approach to adult ECG interpretation. The normal ECG changes as the child grows and the heart develops. The ECG is an important clue to underlying disease and it is important to get an ECG in children presenting with syncope, seizures, palpitations, chest pain, overdose and specific circumstances such as suspected Kawasaki’s disease. If viewing paediatric ECGs is not routine then always use additional resources to guide your interpretation. Life In The Fast Lane Life in the Fast Lane has a section on paediatric ECGs with useful examples and description of a step-by-step interpretation process. Normal Paediatric ECG’s For a series of examples of normal ECGs ranging from 1 day to 15 years old follow this link to Tipple M. Interpretation of electrocardiograms in infants and children. Images paediatric cardiology. 1999; 1(1): 3-13. Paediatric ECG links and apps www.paedcard.com is a website run by a cardiology consultant with paediatric ECG quizzes and links to various mobile resources for paediatric ECG interpretation. Bespoke EM training with an opportunity to focus on your area of specialist interest! Whilst this website can be accessed from inside the hospital some resources may be blocked by trust firewalls. These are better accessed at home with a nice cup of hot chocolate. We can not be responsible for any contents on linked websites but we’ll try to ensure the links are useful and kept up to date. If you have problems then please comment on the About page. EMCAGE.net by Thomas Mitchell is licensed under a Creative Commons Attribution-NonCommercial-ShareAlike 4.0 International License.